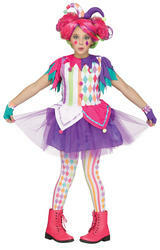 This scary circus clown costume is a great stylish but spooky costume for wearing to a Halloween party. The fabulous costume comprises of a black strapless dress styled with a grey net over skirt and white pom poms up the front, a black neck piece decorated with grey netting, a pair of black and white striped arm covers and completing the look is a black hat decorated with white pom poms up the front and one attached to the top. Black hat decorated with white pom poms up the front, with one attached to the top.